All through Holy Week we have been retelling Mark’s Gospel (the we being All Saints and New Kilpatrick Church) MARKing Holy Week, each day we began with these words. the very beginning when nothing else was. Each service began with those words and then went on to hear afresh the Gospel narrative via Mark, but little did I realise when those words were first written how they would reverberate with what we finally did on Good Friday. and this one from Auschwitz of the shoes taken from those arriving. These images, and others like them, began to speak powerfully to me about Good Friday. What did Jesus come for, if not to heal the brokenness of the world? 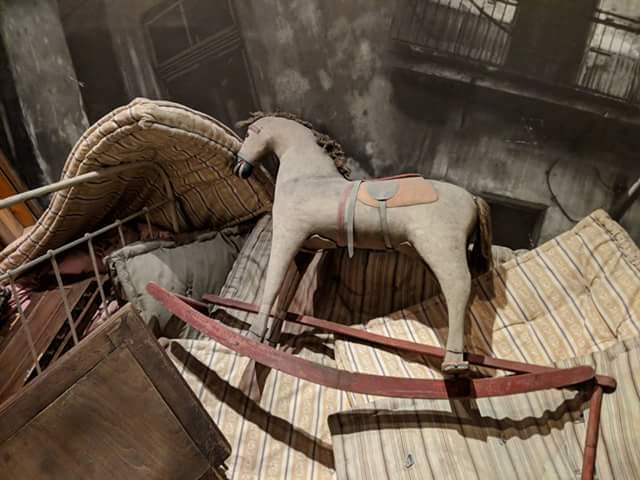 Why did he die, if not to put an end to suffering? Why was love wiped out and why does the world still seem so loveless? Tentatively I suggested the idea and it grew. 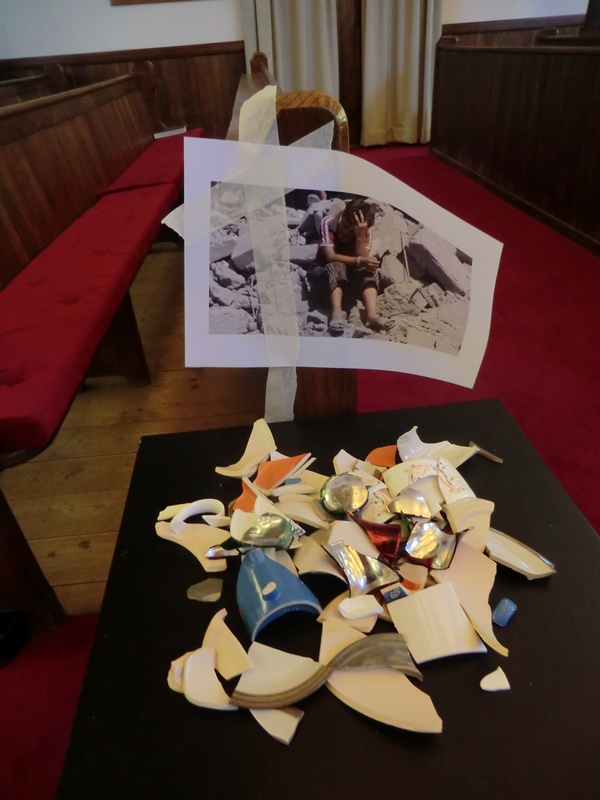 Along with pictures, pictures from far wider than Schindler’s factory and Auschwitz, we placed broken objects, mugs and pens, twigs and cloth, and other things at prayer stations around the church. Broken things to represent our own brokenness, the brokenness of the world, of lives, of communities. Before the service the outline of a cross had been placed on the Chancel floor interspersed with scallop shells, the signs of pilgrimage. And we invited people to fill that cross with the broken things and their prayers, to take to The Cross their brokenness, the world’s brokenness and lay them before Jesus, and so they did. And then with Jesus’ death the temple curtain was torn in two. 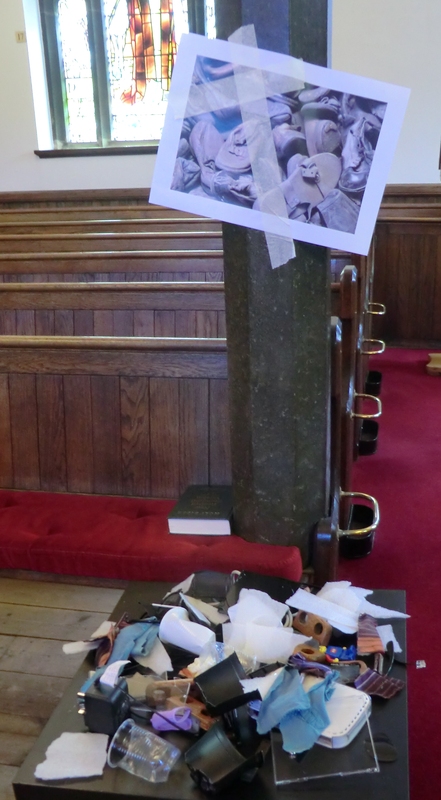 All week All Saints and New Kilpatrick had being MARKing Holy Week together. Up until today we were in All Saints, now in New Kilpatrick Church below Ian Campbell’s stunning triptych, the Light was blown out. As people left they took a shell, a shell of pilgrims and of hope, a shell to mark that they had been, that they had encountered Christ, and that they would take that healing away with them. Okay reaching back further than 30 years was the intent of those opening words, and we would have still arrived at the Cross in a different way, and that would have been good too, and we wouldn’t have known what we had missed. Regardless I think that this particular Good Friday service was 30 years in the making, and a picture or two from further back.